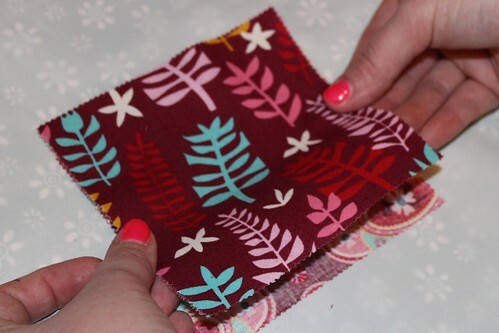 This no-sew project is fun to make as a quick and festive decoration. Liz Scott’s Domestic Bliss collection was perfect for some happy hearts. 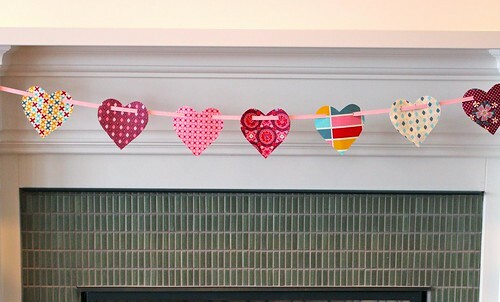 And because the hearts are not permanently attached to the ribbon, you can adjust their spacing to make the bunting exactly the length you need! 1. 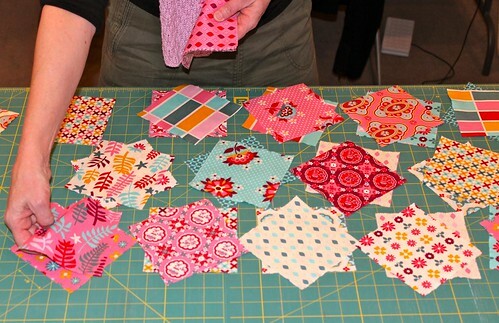 Divide charm squares into 21 pairs. We kept similar colors together so the darker colors wouldn’t show through the lighter sides. 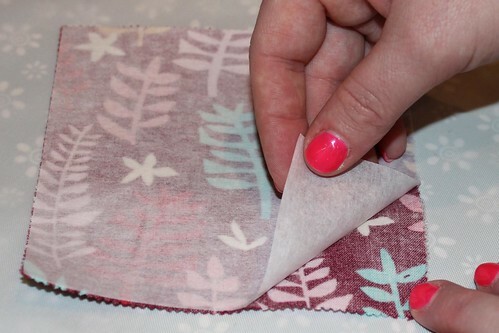 Lay the fusible side down onto the wrong side of one square and press according to the instructions that come with your fusible for heat setting and length of time. 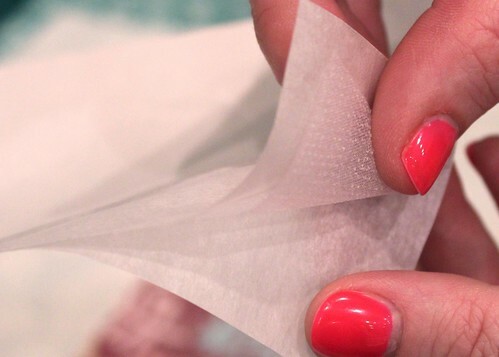 Be sure the sticky part doesn’t peel away from the fabric. 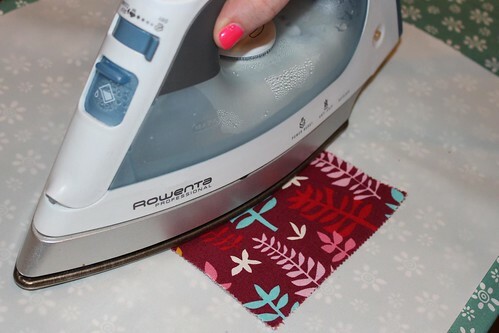 TIP: Keep the fusible facing down so it doesn’t get on your iron. 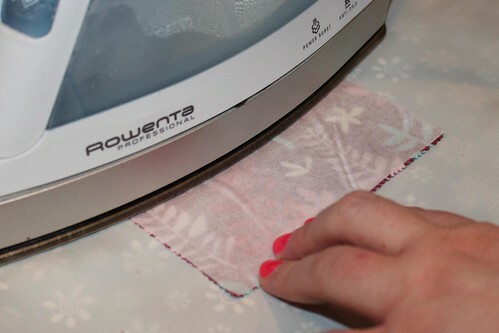 Use a pressing cloth or appliqué pressing sheet underneath everything to keep sticky stuff from getting on your ironing board. Align the first square, fusible side down, onto the wrong side of its mate, and fuse. 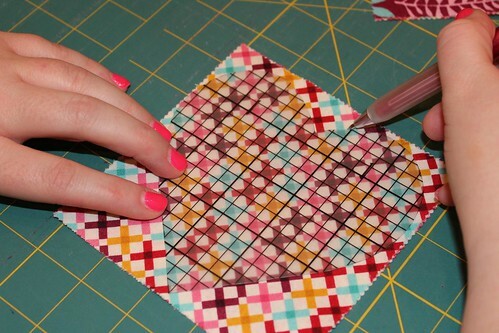 TIP: We found it easiest to do this assembly line style, ironing the fusible to one square from each pair first, and then pressing them all on to the second squares. This way they have a chance to cool down before you have to handle them again. Just don’t get your pairs mixed up! Edit: I thought I’d mention a bit about our experience with the fusible and it’s durability. We’ve made buntings with Steam a Seam and hung them outside for months in the wind and elements without anything coming apart. That stuff is awesome. 3. 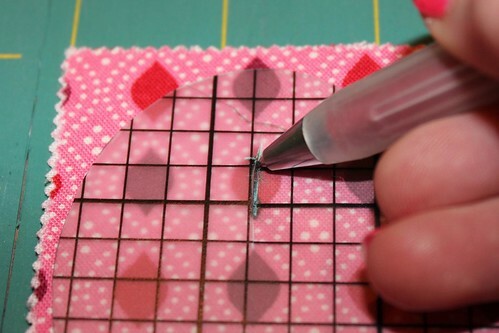 Trace the heart and slits onto each fused square. For the slit, you can just cut into the template plastic and stick your tracing pencil through it to make the mark. 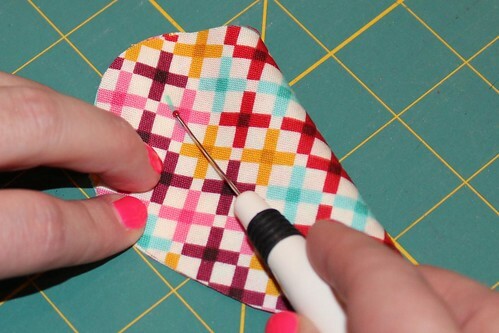 …and cut the slits with a seam ripper, like you would a button hole. Poke the point through all layers, and gently cut to the end of the line. That’s right, the curve inside your seam ripper is a little blade! We only traced one slit, folded the heart in half, and cut the 2 slits at once. 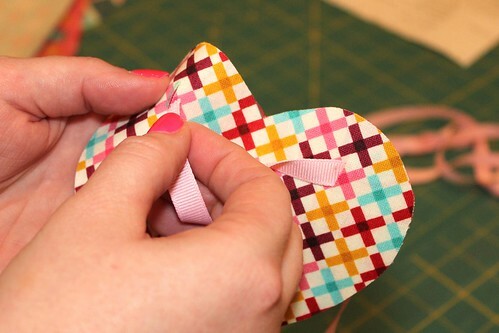 If you are using wider than 3/8″ ribbon, just cut your slits the exact width of your ribbon. 4. 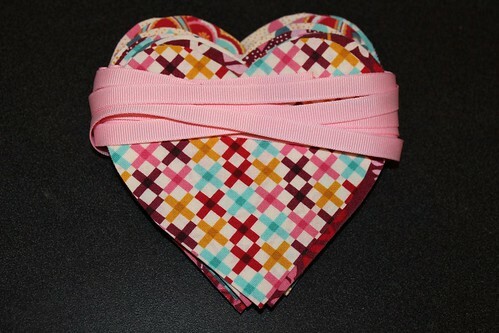 Weave the ribbon through the hearts. 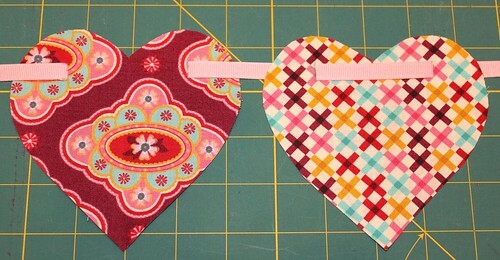 Alternate the direction of the ribbon on each heart (first woven in from the back, then woven in from the front, and so forth) so it will look the same from either side of the bunting. 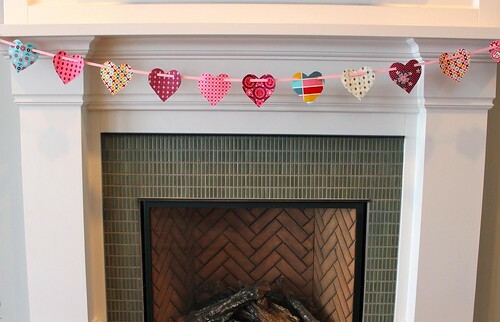 …or farther apart for a different look and a longer bunting. 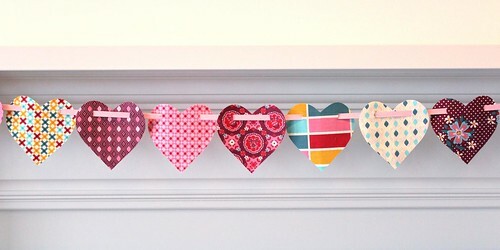 1 heart-warming bunting of adjustable size, for all sorts of spaces! 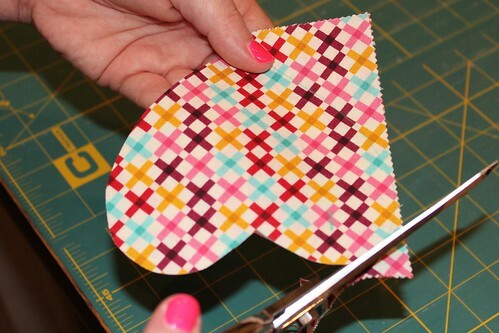 Try some variations, like cutting the hearts out with a wavy blade on your rotary cutter, or dividing the hearts into 2 separate buntings for both sides of the room. Post photos of your own version in our Flickr pool! We hope you enjoy this little project, our very first Moda Bake Shop recipe! We’ve got a few Domestic Bliss Charm Packs available, and don’t forget to check out our blog for other fun stuff. 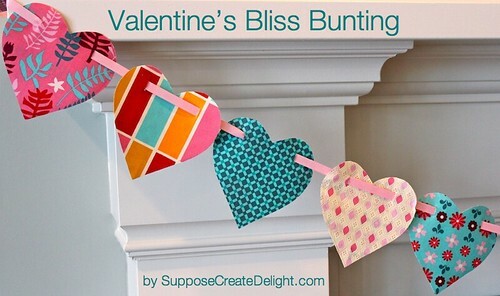 This entry was posted in Charm Pack, Easy, Home Decor, Seasonal and tagged Domestic Bliss, Liz Scott, Suppose Create Delight, Valentine's Day.